Wohlmann House is situated in the southwest corner of Government Gardens and is named after Dr Arthur Stanley Wohlmann, http://www.teara.govt.nz/en/tourist-industry/page-2 an English Balneologist [Who had been practicing in Bath, and had gained a reputation as an expert in remedial treatment by hydrotherapy] who was appointed by the Government as their adviser on balneological matters and superintendent of the Rotorua Sanatorium in 1902, by 1903 Government agreed to a new building to be developed as the Rotorua Bath House [now the Rotorua Museum] it was "opened on 13 August 1908 when the United States 'Great White Fleet' was visiting Auckland, arrangements were made for the fleet commander Rear Admiral Charles Sperry to participate. Some 200 American naval personnel visited Rotorua and after a quick tour of Ohinemutu, marched to the Sanatorium grounds...". 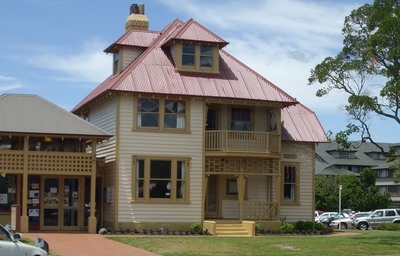 The, above, house was built especially for him and he moved in during 1908. By 1915 he had changed his surname to Herbert and was known by that name thereafter. 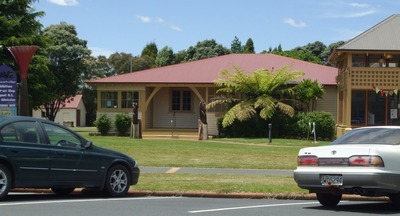 This house was subsequently used as a residence for hospital staff until 1986 when it was made the headquarters of the Rotorua District Community Arts Council and a base for numerous community arts and crafts. The Rotorua District Council has administered and maintained the building since its takeover of the Government Gardens from Government control in 1983. Excerpt from "The New Century in Rotorua" by Don Stafford.